Parents at Palo Alto High School are outraged after being told a student who had been convicted of one sexual assault and accused of another was allowed to remain on campus. Kris Sanchez reports. Parents at Palo Alto High School are outraged after being told a student who had been convicted of one sexual assault and accused of another was allowed to remain on campus. On Tuesday night, parents demanded answers, and the school board moved to make immediate changes in its reporting and disciplinary policies. 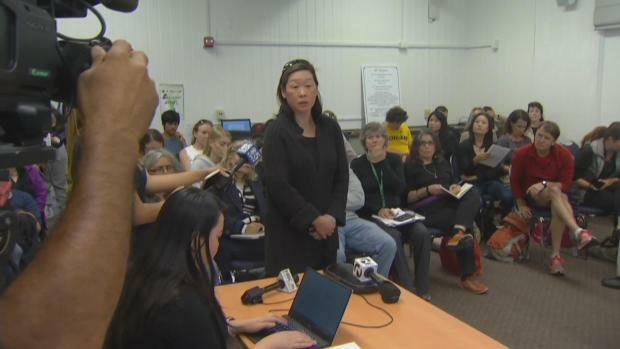 While the school district said it cannot divulge information about a minor, NBC Bay Area learned Tuesday that the student in question left the school voluntarily. District officials still weren't clear about why the student wasn't moved to another campus. Parents at Palo Alto High School are outraged after being told a student who had been convicted of one sexual assault and accused of another was allowed to remain on campus. Terry McSweeney reports. "We need to know when we have an active predator around so they can be aware of this, of course," parent Saundra Zenger said. Parents just found out about the assault that happened off campus in 2015. The assailant, a junior at Palo Alto High, was convicted in December of forced oral copulation. "My daughter has two classes with the person in question," parent Rhyme Adzema said. "He has acted inappropriately towards her, and I don't know what's going on." The Palo Alto Unified District school board met in closed session Tuesday evening to evaluate the way Superintendent Max McGee handled the matter. "We can't disclose anything about minors," a district spokesperson said. "We can't disclose anything regarding contact with the police, with the juvenile justice system. I can't even tell you if they're in school today." The student's attorney released a statement, saying, "Although the District Attorney's Office has declined to file anything against the student, other than consensual underage sexual activity as a result of the conduct on campus, the student has elected not to complete the school year on campus." Meanwhile, parents clamored for changes. "I want to know that this administration is dealing with these types of issues with this or others in a serious manner," Chris Cummings said. The school board announced changes in the way it handles reporting of sexual assaults or harassment, is adding a new administrative position and is renewing its educational efforts for staff and students.